♥UNIQUELY STYLISH♥ We ensure each Women’s Cuff Bracelet is made superior artistry with keen focus on details so you can get a fashion piece that is simple yet totally exquisite. An overall handwoven design ensures we finely finish each piece. ♥JUST THE PERFECT SIZE♥ This Hand woven Bracelet features dimensions; 7.7*1.5 inch just the right size to comfortably fit on your wrist. An ultra-light 37g will feel as if it is not there. What’s more, we also fit a magnetic buckle so you can securely wear around your wrist. Do you love unique, simple yet super-sleek fashion pieces? Or do you wish to have to compliment your every-day outfit with top class bracelets effortlessly? 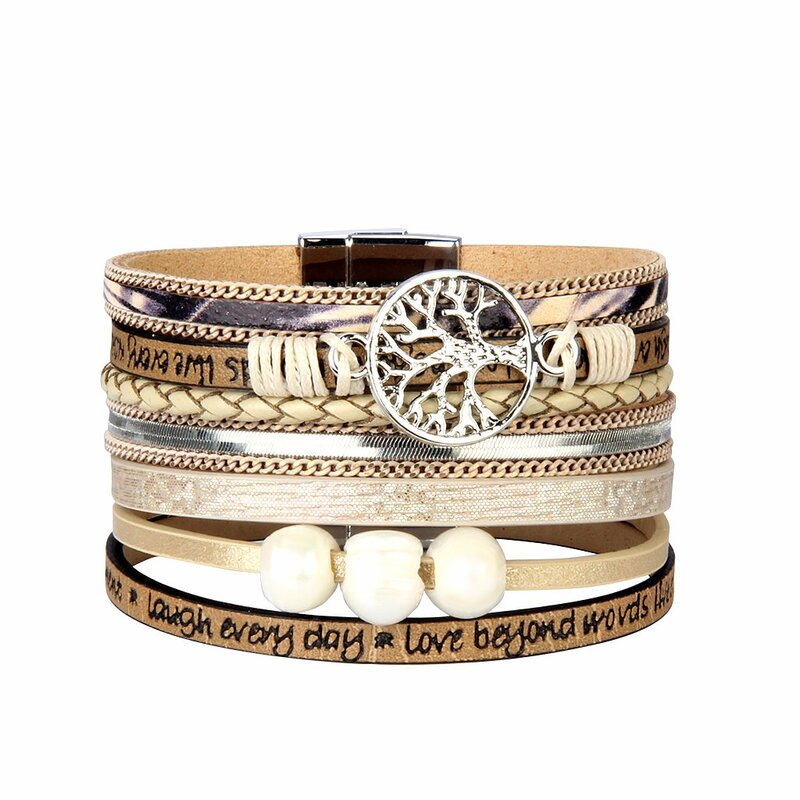 boy do we have just the perfect Leather Wrap Bracelet for you. A Simple Yet Trendy Fashion Piece- Ooze Class, Elegance & Style Just Like You Are Supposed To! Designed with impressive alloy tree parts with artificial we ensure this Leather Band Bracelet will make you stand out & look super-cool. To ensure you’re going to use this elegant bracelet we use genuine leather for our straps. A superb 7.7*1.5 inch with a lightweight 37g ensures you’re going to love wearing this Cuff Bracelet; a custom fitted magnetic buckle for that added security. Put on this Cuff Bangle when you’re going for that wedding, picnic with friends, for work, on dates & add that unique, classy touch to your overall look. Click ‘Add To Cart’ To Get Yourself This Stylish Bracelet and Get That Complete Outfit Compliment! 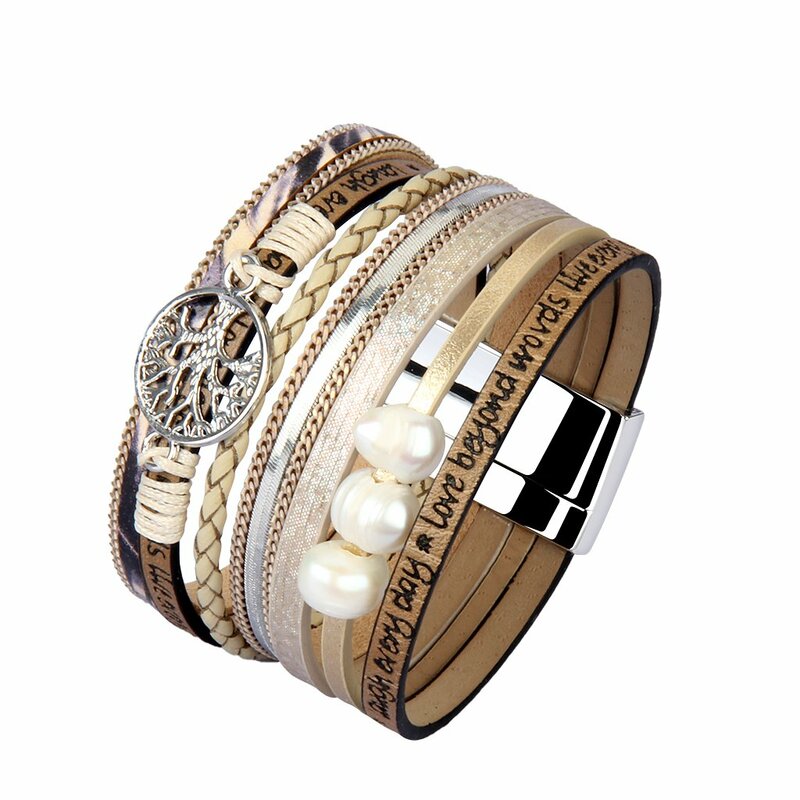 ♥A TOP CLASS QUALITY♥ Our Leather Wrap Bracelets is made with impressive alloy tree parts with artifical pearl custom made to give that outstanding finish. With straps made from genuine leather, we ensure you’re going to get supreme durability at the same time as still satisfying your swank taste. ♥UNIQUELY STYLISH♥ We ensure each Women’s Cuff Bracelet is made superior artistry with keen focus on details so you’ll be able to get a fashion piece that is simple yet totally exquisite. An overall handwoven design ensures we finely finish each piece. ♥JUST THE PERFECT SIZE♥ This Hand woven Bracelet features dimensions; 7.7*1.5 inch just the right size to comfortably fit on your wrist. An ultra-light 37g will feel as if it is not there. What’s more, we also fit a magnetic buckle so you’ll be able to securely wear around your wrist. 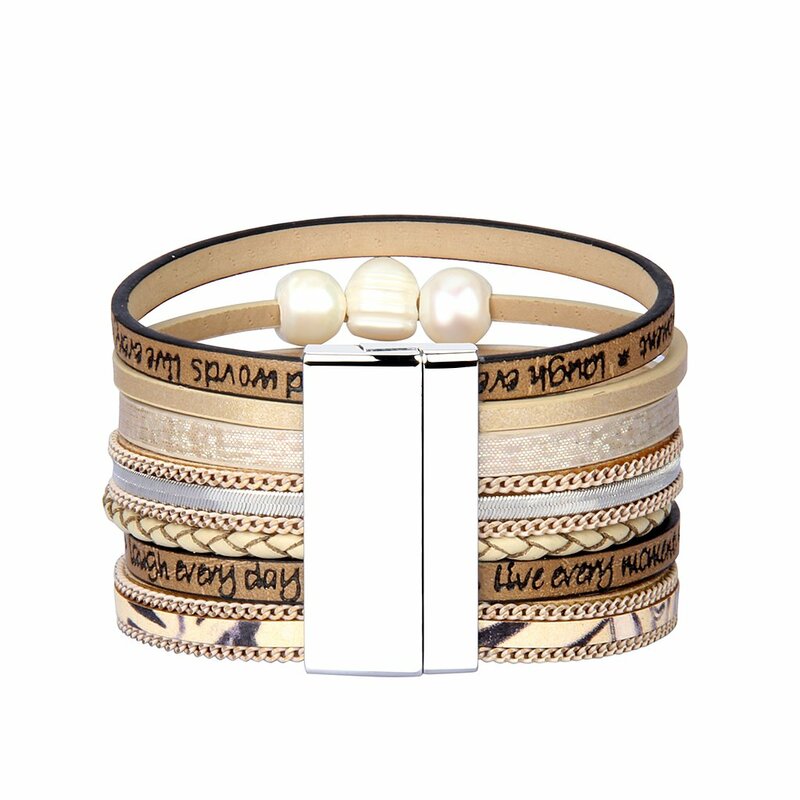 ♥A GREAT GIFTING♥ Available in grey,beige,brown,black or blue colors, this Cuff Bangle for Women is the perfect gift for your sister, mom, brother, and girl or boy friend. Get her this Leather Bracelet & transform a Gift Hero! ♥DESIGN IDEA♥ The Tree of Life is associated with knowledge and wisdom. A simple Tree of Life bracelet can keep you inspired and encouraged, help you find strength and stability. The Tree of Life with its branches and roots signifies the family tree. It is going to Infuse Abundance and Prosperity into Your Life. When you wear it, it promotes beauty, health, good luck, and healing. It is also a great gift for your best friend, significant other, or anyone who enjoys leather handmade fashion jewelry.